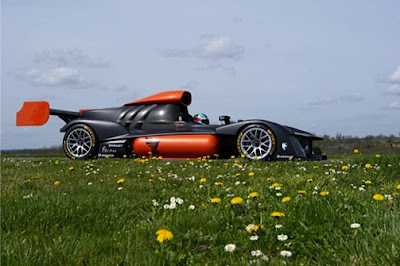 Those of you hoping for a hydrogen fuel cell powered race car, in the 24 Hours of Le Mans, prepare to be disappointed. The GreenGT entry in that race, a hydrogen fuel cell race car, has just pulled out of the event. While they were able to show the race car on the track, one reads between the lines that they weren't quite ready for a 24 hours endurance race. According to a press release issued on Saturday June 1, the team will continue testing the GreenGT H2 until June 5. Performance is in line with test bench results. However, the press release explained that "the highly complex phase of fine tuning the high power hydrogen fuel cell is in conflict with the on track endurance test programme, an essential requirement for participation in a demanding race like the Le Mans Classic event." Managing director Jean-Francois Weber saying: "The GreenGT H2 is already showing great potential and has great scope for improvement. However, the complexity and cost of this unique model requires the use of extremely rigorous methods and very time-consuming new procedures. We are only at the beginning of this adventure, and it is essential for us not to cut corners and continue the development of the GreenGT H2." Jean Michel Bouresche, Sales & Marketing Director of GreenGT, says: "First of all, we wish to thank ACO for its confidence in GreenGT. Box 56 is a splendid initiative for encouraging innovative technologies. The GreenGT H2 fits perfectly in to this scenario and, although the Le Mans 2013 event has come too soon for us, we are actively working with ACO on a worldwide presentation programme for the GreenGT H2. The names of world famous drivers will be announced at the 24 Hours of Le Mans. They will be our ambassadors for the presentation of this technology of the future." Vincent Beaumesnil, Sports Director of ACO, says: "The technology of the GreenGT H2 is perfectly in line with the spirit of innovation that ACO intends to promote with Box 56. It works, and the ACO was right in believing in the technological merits of this project. But the 24 Hours of Le Mans is a high endurance event, and it is premature for the GreenGT H2 to take up this challenge. However, we will continue to support this initiative and, together with GreenGT, we will soon announce a world wide demonstration tour which will take place during the same week as the 24 Hours of Le Mans and, possibly, an unranked presence at the start of a World Endurance Championship race, as the regulations allow the presence of this type of vehicle on the starting grid."